Sultanahmet is one of the main tourist districts in the old city of Istanbul and is a popular destination for its architecture and history. There is no direct metro route to Sultanahmet, so you will need to take a a combination of public transport to reach the district, which can take around an hour and cost in total around 0.70€ (3.40TL). Alternatively, there is the option of Havabus from the airport, however it will not take you into Sultanahmet, therefore will require a reasonable walk from the stop. This will take around 40 minutes and cost 2.40€ (12TL). An Ataturk airport taxi is the only method of direct transport, and will take around 30 minutes and cost 8.80€ (45TL). The metro will not go directly to Sultanahmet, so you will need to take it part of the way and then switch to the tram to take you into the old city district. The metro is available from the airport, line M1a, and you should ride it until you reach the stop "Zentinburnu" (6th stop). Alight here, and move to the tram (T1) line to Eminönü or Kabataş, and listen out for "Sultanahmet" or "Blue Mosque" for the stop on the tram. The journey should take approximately an hour. How much is the metro from Ataturk Airport to Sultanahmet? 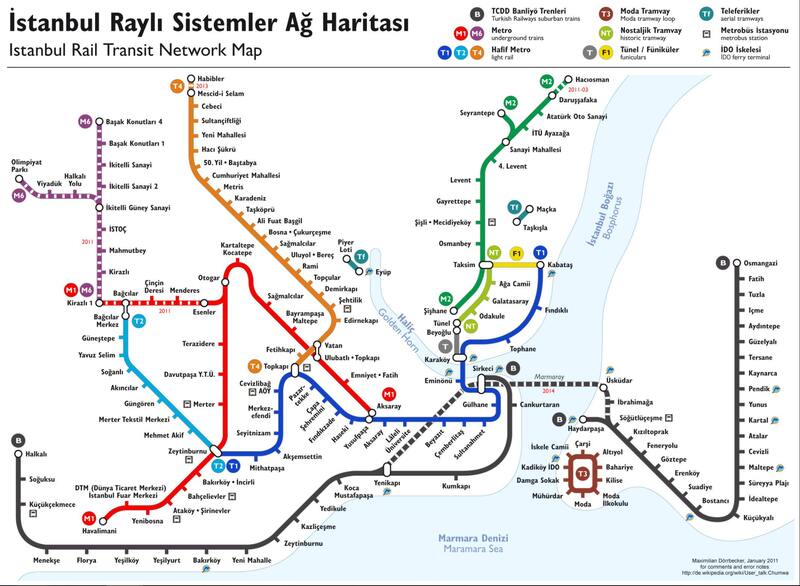 The best and most cost efficient payment method for the metro + tram together is the Istanbulkart - which will bring the journey for both to 0.70€ (3.40TL). However, the metro takes 3 payment types and each price differs. Depending on which one suits your needs it can be quite cheap, or rather pricey. If you plan to utilise public transport a few times while in Istanbul (this includes metro, tram, bus and funicular) then it is best value to purchase an Istanbulkart, which is a re-loadable card that scans on entry – and includes a discount. The journey this way will cost 0.80€ (1.95TL), plus 2€ (10TL) for the card, available at the service counters in the airport. Otherwise, you can purchase a Jeton from the Jetonmatick machines, which are single use tokens. You will need two per person at a cost of 2€ (10TL) per person for the journey. Alternatively, you can collect a single use paper ticket from the Biletmatik, which is cheaper the more journeys purchased on it – for a single journey it will cost 1€ (5TL). The metro is available from the airport arrivals lounge, with a 10 minute walk to the station. The airport is full of signage to direct you. Although the cheapest option, the metro can be busy and crowded, as can the tram, therefore both are a struggle with luggage. The change in transport types and lines can be an additional hassle after a long journey. The Istanbulkart is a good purchase for ease in getting around the city, as it can be used on most public transport and provides a cheaper rate than regular single-use ticket purchases. The trams provide the routes to many areas in the old city, and are a historical part of Istanbul. You should be able to easily change from metro to tram in the same station as you arrive. Be careful on public transport - pickpockets are rife. The airport provides yellow taxis at a stand outside of the airport that will take you to Sultanahmet, in the old city district. Ensure that you check that the taxi has a meter clearly displayed and that you pay by cash to be sure that your change is correct. The taxi journey should take around 30 minutes in normal traffic by this method. The taxis outside the airport run on a meter, and therefore the price may vary. However, a ride to Sultanahmet from the airport should cost you around 8.80€ (45TL). Taxis are the only direct method to get you from the airport at Ataturk to Sultanahmet, as well as the most comfortable with luggage. However, you will need to be cautious using this method as tourists often get overcharged by drivers. You will likely be approached by people in the airport operating shuttle services who offer to take to your destination. It is advisable not to take this offer as tourists are often overcharged by these individuals. It is best to have a variety of notes (TL) at your disposal as drivers may not have lots of available change. Only take taxis parked at the rank that clearly display a meter, which is turned on at the start of the journey. It is advisable to write down your address of the location you wish to go to avoid language issues. The Havabus, a private bus company, operates the route between the airport and Taksim that stops along the way to Aksaray (Mamaray), which is a 30 minute walk or 5-10 minute tram ride from the old city and the district of Sultanahmet. You will need to take the bus from the airport arrivals and the journey will take around 20 minutes to reach Aksaray, and another 5-10 minutes if you take the T1 tram from there (to Eminönü and/or Kabataş). How much is the bus from Ataturk Airport to Sultanahmet? The fare for the Havabus journey is 2.40€ (12TL), regardless of where you alight. The Havabus may accept Istanbulkart at a discount, but it is best to check beforehand. Pay in cash on the bus. The tram takes 3 payment types and each price differs. Depending on which one suits your needs it can be quite cheap, or rather pricey. If you plan to utilise public transport a few times while in Istanbul (this includes metro, tram, bus and funicular) then it is best value to purchase an Istanbulkart, which is a re-loadable card that scans on entry – and includes a discount. The journey this way will cost 0.40€ (1.95TL), plus 2€ (10TL) for the card, available at the service counters in the airport. Otherwise, you can purchase a Jeton from the Jetonmatick machines, which are single use tokens, 1€ (5TL) per person. Alternatively, you can collect a single use paper ticket from the Biletmatik, which is cheaper the more journeys purchased on it – for a single journey it will cost 1€ (5TL). There can be up to a 30 minute wait for the bus. The bus stop is located outside of the arrivals terminal at Ataturk Airport. Although the bus provides a relatively comfortable transportation, the lack of direct route and limited destinations/stops (as well as higher cost) can be troublesome - especially for those with luggage. The Havabus operation is privately owned and not publicly funded, and therefore if you have a large group can be even more expensive than taking a cab. If you are planning on taking the tram, buying an Istanbulkart can reduce the cost of your onward journey. Havabus is now accepting Istanbulkart as a method of payment - so a discount is possible. Trams are often crowded - wait for the next one if this one is too full for luggage. How much is a taxi from Ataturk Airport to Sultanahmet? How many transfer options are there between Ataturk Airport and Sultanahmet? There are three transfer options - by bus, taxi or metro. However, if you wish to take a direct route, a taxi is the only one available for this. How far is Ataturk Airport from Sultanahmet? The airport is located 20.3km away from the Sultanahmet District, the journey will take around 40 minutes in standard traffic.